Combination locks are useful apparatuses to secure things that you want to be kept safe. The only problem with combination locks is that, when they get broken or worn out in some way, they are very difficult to open. However, if your combination lock is broken, there are several things that you can do to get into the place that was being secured. All that you need to do is follow several solutions that can safely open the lock. 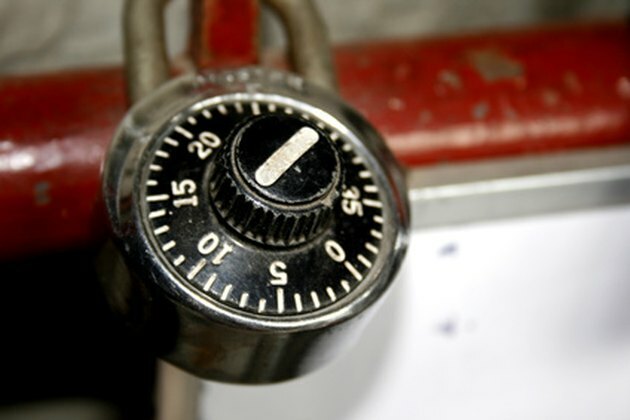 Combination locks require the insertion of three to five numbers in a particular sequence. Use the key. There are some combination locks that come with keys to open the backs if the lock breaks. This allows you to open the combination lock without having to input the numbers. However, since not all combination locks come with keys, this may not always work. Sometimes, the broken part of the combination lock bars the key as well, making it equally ineffective. Snap the head of the combination lock off to reveal the internal mechanism. This can be done by sliding a flathead screwdriver into the edge of the combination head and applying pressure against the head. Doing this will pop off the combination head, revealing the guts of the lock. From here, you can see what the problem is and perhaps fix it. If nothing else, you can see where the lock latches and might be able to simply snap it open with the screwdriver or a similar instrument. Hammer the lock off. If all else fails, simply bash the lock off using a hammer or similar instrument. This should be used as a last resort since doing this can damage what the lock is attached to and eliminates all possibility of fixing or salvaging the lock. This solution is the only surefire way of getting the lock off.